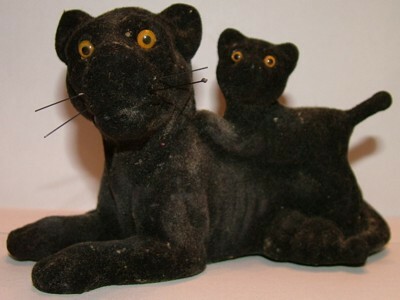 These two panthers are one piece of hollow plastic covered in black velvet; they are a very light plastic toy. Weighs 2.3 ounces. 5 inches long and 3 inches tall. About 2.5 inches wide. Fur is all intact, eyes are orange. Has a gold "Made in Hong Kong" sticker on the bottom. This piece is over 30 years old. He is dusty, but should clean up nicely if you're careful. Cleanup is at your own risk. 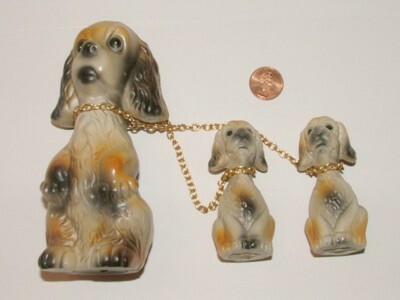 A set of 3 plastic figures connected by a cheap gold chain, plastic, paint appears to be sprayed on. There is no maker's mark. The mother dog sits in a begging pose. She's about 5 inches tall, about 2 inches wide and deep. The two pups are sitting upright in a prim and proper position. They are about 2.5 inches tall, about 1 inch wide and deep. These are lightweight, hollow, plastic figures, made from a mold. Their total weight is 2.4 ounces. These little guys are in overall good condition, mother dog has some light paint wear on her ears. These little dogs are well over 30 years old.